Looking for historical fiction that will transport you to another time and place? One with the sweep of a Doctor Zhivago? Based on the diary of a countess, this story will enthrall you. 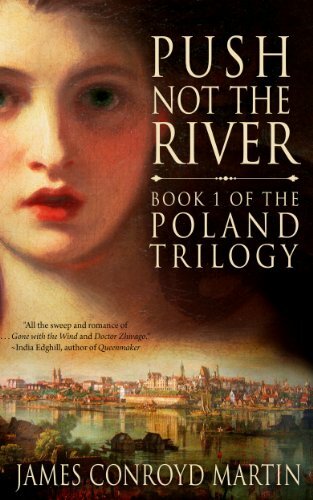 A panoramic and epic novel in the grand romantic style, Push Not the River is the rich story of Poland in the late 1700s--a time of heartache and turmoil as the country's once peaceful people are being torn apart by neighboring countries without and divided loyalties within. At the vulnerable age of seventeen, Lady Anna Maria loses both of her parents and must leave to go to live with relatives, thrusting her into a world of love and hate, loyalty and deceit. Even kind Aunt Stella, Anna's guardian who personifies Poland's courage and spirit, can't protect Anna from the uncertain future of the country. Anna turns to love and comfort in Jan, a brave patriot and architect of democracy, unaware that her beautiful and enigmatic cousin Zofia has already set her sights on the handsome young fighter. Thus Anna walks unwittingly into Zofia's jealous wrath and darkly sinister intentions. Surviving several tragic events, some orchestrated by the crafty Zofia, a strengthened Anna learns to place herself in the way of destiny--for love and for country. Heeding the proud spirit of her father, Anna becomes a major player in the fight against the countries who come to partition her beloved Poland. Push Not the River is based on the eighteenth-century diary of Anna Maria Berezowski, a Polish countess who lived through the rise and fall of the Third of May Constitution. Vivid, romantic, and thrillingly paced, it paints the emotional and unforgettable story of the metamorphosis of a nation--and of a valiant and resilient young woman.